Summery : Sarah is doing just fine. Sure she’s been single for the last five years, and has to spend an uncomfortable amount of time around her ex-boyfriend, his perfect new girlfriend and all their mutual friends. And yes, her job as a PA to one of the most disgusting men in London is mind-numbingly tedious and her career is a constant disappointment to her mother. But it’s really okay. She’s happy (ish). So it’s not surprising that when Sarah starts dreaming about a handsome stranger, she begins to look forward to falling asleep every night. Reality isn’t nearly as exciting. That is until her dream-stranger makes an unexpected real-life appearance, leaving Sarah questioning everything she thought she wanted. Because no one ever really finds the person of their dreams… do they? After working my way quickly through Billy and Me and You’re The One That I Want, I could not wait to get my hands on Dream A Little Dream the moment it was announced. Giovanna Fletcher is the one chick-lit author I follow closely on Twitter, hoping for a new announcement for a release just days after her publication date for the last! Dream A Little Dream was most definitely a read worth waiting a year for! So very few times am I able to connect with characters that are somewhat older than me (Sarah is coming in to her thirties in this novel leaving us with a ten year age gap) but every time Giovanna writes for one of her gorgeous girls I can’t help but take on their little world to live in myself. The protagonist Sarah is a little bit ditsy, a little bit fierce and a little bit lost. But this is what makes her loveable and so connectable with almost anyone. The one brilliant thing Giovanna creates are characters who have flaws and are so ‘real’! Along with Sarah, you automatically fall in love with her friendship group (Carly and Josh are a particular fave of mine) who have their problems but you can’t help but want a bunch exactly like them. Also after reading Billy and me back in 2013 I thought I’d never find another dream man like Billy Buskin until Brett turns up in Sarah’s life and I fell head over heels all over again. The premise for this book had me intrigued from the start as dreams are not something I’ve come across in chick-lit novels often. I wondered how it would work writing dreams and if they would come across to be as wacky as dreams actually are on a page! However Giovanna was able to portray that idea perfectly and made each dream interesting and funny. Giovanna is able to turn a contemporary romance novel in to something so excitingly different with heavy influence on friends and family. Giovanna pours her bubbly personality in to Dream A Little Dream and as a result Sarah ends up reminding me of her quite a bit while reading (as did Sophie in Billy and Me!) Her writing style is absolutely perfect for those summer days where you want nothing more than to immerse yourself with the worlds she creates. 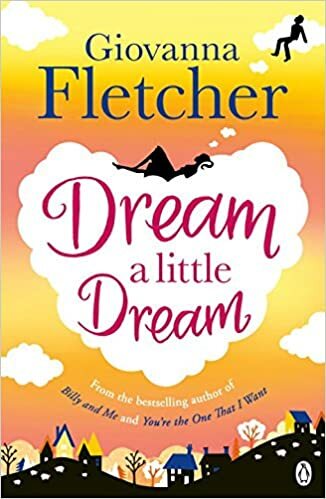 Dream A Little Dream is funny, heart-warming and fast paced, keeping you interested all the way through – and it definitely keeps you on your toes. The only criticism I have is WHAT HAPPENS AFTER THE END!? The writing is not meant to be world class and deserving of a ‘modern classic’ stamp, it is meant to be fun and enjoyable. If you enjoy light and breezy stories, perfect for either reading by a pool or tucked up in bed with a glass of hot chocolate (or wine) I’d look no further that Dream A Little Dream!